My daughter, who goes to Stuyvesant High School only blocks from the World Trade Center, thinks we should fly an American flag out our window. Definitely not, I say: The flag stands for jingoism and vengeance and war. This is how "Put Out No Flags" begins, a milestone post-9/11 essay by Katha Pollitt in the October 8, 2001 edition of The Nation. Well known for her audacity, intelligence and keen sense of humor, Pollitt has been a columnist with The Nation since 1995 and is frequently quoted in the mainstream US media. The Washington Post praised her column ("Subject to Debate") as "the best place to go for original thinking on the left." A veteran essayist, Pollitt's prose pieces have been published in The New Yorker, The Atlantic, The New Republic, Harper's, The New York Times and The London Review of Books. Her essay "Why Do We Romanticize the Fetus?" received an award in 1993 from the Planned Parenthood Federation of America. 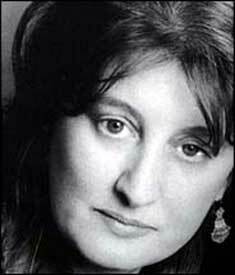 Pollitt has won the National Magazine Award twice (1992, 2003) and was honored in 2010 with an American Book Award for Lifetime Achievement. Katha Pollitt was born on October 14, 1949, in Brooklyn, New York. Her father was a lawyer who thought that grand juries were unlawful because they excluded blacks and women. Her mother, a real estate agent, protested against segregation and Nazi collaborators. Pollitt received an AB from Radcliffe College and an MFA from Columbia University. She has lectured at numerous universities, including Harvard, Yale, Princeton, UCLA and Cornell. She has taught poetry at Princeton, Barnard and the 92nd Street Y, and women's studies at the New School University. According to the late Susan Sontag, Pollitt delivers "the liveliest, smartest general essays on women's issues today." Pollitt's selected contributions to The Nation are collected in three books. "Reasonable Creatures: Essays on Women and Feminism" (1994) was hailed by Gloria Steinem as "fine, fierce, well-informed and mind-changing." The book's title alludes to a line in Wollstonecraft's "A Vindication of the Rights of Woman" (1794): "I wish to see women neither heroines nor brutes; but reasonable creatures." "Subject to Debate: Sense and Dissents on Women, Politics, and Culture" (2001) and "Virginity or Death! And Other Social and Political Issues of Our Time" (2006) also received high praise from critics. "Learning to Drive and Other Life Stories" (2007) tentatively departs from political commentary and is dedicated to her parents. The title piece "Learning to Drive" is anthologized in "The Best American Essays 2003," edited by Anne Fadiman. Pollitt is currently finishing a book on abortion politics. For her poetry, Pollitt has received a grant from the National Endowment for the Arts and a fellowship from the Guggenheim Foundation. Her 1982 collection "Antarctic Traveller" won the National Book Critics Circle Award. Her second collection of verse, "The Mind-Body Problem," came out in 2009. Reviewing it, Kay Ryan said: "It's awfully good to have such a great-hearted poet as Katha Pollitt take on mortality's darkest themes." I selected the title piece from this second collection for this week's poem. Given that Pollitt majored in philosophy, the poem's hilarious take probably comes as no surprise. One of the most stunning poems ever written on the subject of "regret" (and the conflict between infatuation and suppression), "Mind-Body Problem" is a true gem. For my younger readers: "The metaphor equating the relations between mind and body to 'Tony Curtis / and Sidney Poitier fleeing handcuffed together' is a reference to Stanley Kramer's 1958 movie 'The Defiant Ones,' in which a white and a black convict are shackled together as they flee from the police in the segregationist South" (from "The Oxford Book of American Poetry," by David Lehman, 2006). "Mind-Body Problem" was first published in The New Republic (October 6, 1986). It also appears in "The Mind-Body Problem." You can hear Pollitt reading it at http://www.youtube.com/watch?v=-QESvJOgbIY. A wide-ranging archive of Pollitt's work is available at http://kathapollitt.blogspot.com.